The Bayport Aerodrome sees about 10,250 combined landings and takeoffs per year. The public airport is 50 acres. It was designated a national historic site in 2008, according to the town. The airport is also home to the nonprofit Bayport Aerodrome Society that specializes in antique airplanes. Engineers are studying — through land and air — Bayport Aerodrome grass runway, searching for obstructions that could make landing and taking off from the historic airport difficult for pilots, Islip officials said. The $160,000 initiative, which will be 90 percent funded by the Federal Aviation Administration, will be the first study looking for potential obstructions — such as tall trees — since 2012 at the town-owned airport that services noncommercial airplanes. 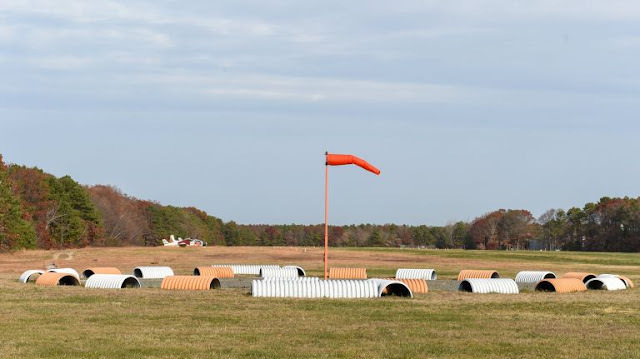 The Islip Town Board hired Manhattan-based DY Consultants on Aug. 21 to conduct the study at the nearly 2,800-foot-long runway that stretches 75-feet wide. Islip and New York State will each shell out nearly $8,000 for the project. But LaRose-Arken said Islip’s share will be reimbursed by the passenger facility program, a $4.50 ticket tax for passengers at Long Island MacArthur Airport, which is also owned by Islip. The 2012 study concluded some trees were obstructing the runway, LaRose-Arken said. The analysis is expected to be completed in the spring, officials said. Some possible fixes for obstruction are topping of trees or lighting objects, LaRose-Arken said. Residents in 2007 living near the airport were upset after a contractor hired by Islip cut down 100-year-old trees that did not violate the federally mandated height restriction of 17 feet. The town had approved an $88,000 tree-trimming project to comply with FAA requirements. The contract was for trimming trees south and east of the airfield. Islip Supervisor Angie Carpenter said neighboring residents will be kept informed of the study's findings. “The airport administration and town are extremely sensitive to the community with respect to vegetation and trees in and around Bayport Aerodrome. Extensive community outreach will be conducted prior to any work to be performed,” she said. Erik Birdsall, 50, lives south of the Aerodrome and moved into the home in 2008. He remembers there was a "whole uproar. The company came in and lopped off the trees to a certain height. All the neighbors were outraged,” he said. However, Birdsall welcomes the obstruction study and its conclusions because safety is paramount. “If they say they got to cut a tree to make it safer, by all means — cut a tree,” he said.